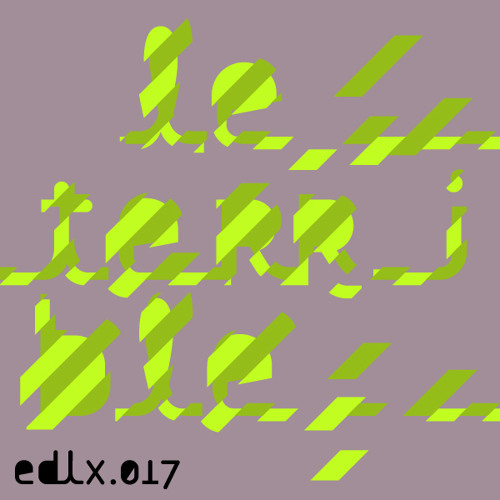 Electric Deluxe is proud to present the new Terence Fixmer EP „Le Terrible“. And as the name already suggests this EP is up for some serious damage. A Side kicks off with „Le Terrible“ a dynamic and powerful monster of a techno track which pumps up your adrenaline with its pounding bass drum and hypnotic built ups. Gut Feeling! B1: „Concept C“ is a strong track in which terence fixmer works his production magic with more experimental elements such as drone sounds and his ragged and slightly distorted signature bass. Nonetheless creating a high energy level tune ready to be unleashed on the dancefloor. B2: Last with the vinyl version „Dance like Paranoid (Marcel Dettmann Remix)“. Marcel Dettmann‘s remix wins you over by its carefully arranged melody and drum pattern which creates a melancholic and timeless rave anthem. Bliss! Digitally the release is accompanied by „Le Terrible (Terence Fixmer Tool)“ captivating the essential sound scapes of the original. ‚le Terrible‘ le techno sublime!